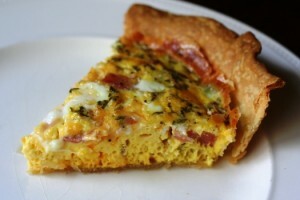 Super simple quiche recipe. All you have to do is combine the ingredients in a bowl, toss in a pie crust and bake! In a large bowl, beat together milk, eggs, butter and parmesan cheese. Stir in spinach, ham and Cheddar cheese. Bake in preheated oven for 40 minutes, or until eggs are set and crust is golden!